Steinway Model M, 1930, totally restored from the ground up to the highest standards with the following state of the art piano modifications: Stanwood Precision Touch Design, Stanwood Adjustable Leverage Action, Wapin Bridge , New top shelf hand made Isaac Crescendo Hammers, new Bolduc pin block, new blued nickel pins and mapes gold strings, new Bolduc Alaskan sitka spruce soundboard, new keytops, new Steinway wippens, new dampers, bushings. Action just regulated and voiced to world class level. Piano just refinished with high-end hand rubbed satin finish. One of the modifications this piano has is the Stanwood Adjustable Leverage Action, which has the ability to instantly change the keyboard’s touch from heavy to medium to light by the simple turn of a dial. This piano is only the second one in existence that has this incredible modification installed. Also included are Dampp-Chaser Humidity control rods and sensor, adjustable artist’s bench with storage and a custom vinyl cover. Questions? Call Sonny Direct at 631 475-8046. Free Local LI/NYC delivery all else continental USA only $475. Visit http://www.SonnysPianoTV.com for more videos of our pianos for sale. 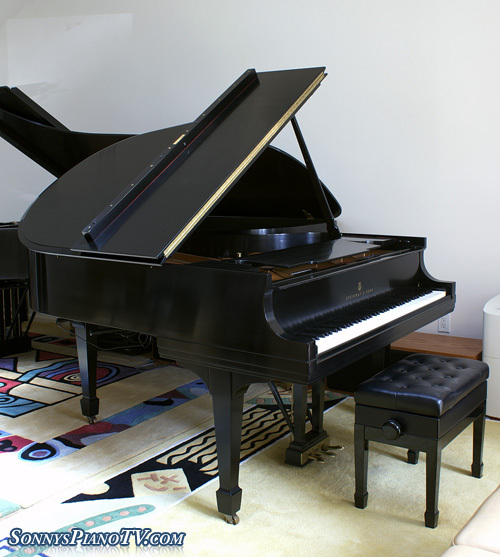 This entry was posted in Adjustable Leverage Action, Bolduc Alaskan Sitka Spruce Sound Board, Bolduc Pin Block, Custom, Dampp-Chaser Humidity Control, David Stanwood, Ebony, Isaac Crescendo, Model M, Piano Technicians, Rebuilt, Refinished, Satin, Steinway, Wapin Bridge and tagged Adjustable Leverage Action, Bolduc Alaskan Sitka Spruce, Bolduc Pin Block, Dampp-Chaser Humidity Control, David Stanwood, Ebony Steinway, Isaac Crescendo Hammers, long island piano for sale, Model M, Piano, Piano for sale, Pre Owned Steinway New York, steinway model M, steinway piano, Wapin Bridge. Bookmark the permalink.